We are delighted to welcome Jenny Howarth and Nicky Whitehead, both complementary therapists who have been practicing in Ilkley for many years, to Cottage 2 at the Manor House. They will be bringing their work from South Hawksworth Street to this new home’ said Sarah Thomas, chair of the Manor House Trust. Jenny and Nicky will be running Ilkley Complementary Therapies and Yorkshire Flower Essences from the lovely cottage space next to the Manor House. Jenny Howarth and Nicky Whitehead, of Ilkley Complementary Therapies, have been working closely with Michelle on the evolution of the therapy practice. 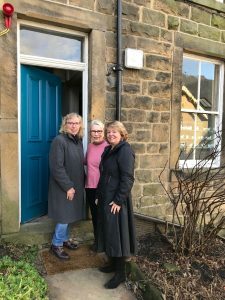 Together they will ensure that the new practice combines the foundations laid by Michelle with their own business ‘Ilkley Complementary Therapies’ which has been operating for 17 years in the centre of Ilkley. The therapies available will continue as previously, including Homeopathy, the Bowen Technique, Shiatsu, Hypnotherapy, several types of Massage, including Pregnancy and Baby Massage, Herbalism and Nutrition, Reflexology. There will be additional therapies on offer, too,as more therapists are in the process of joining the new Ilkley Complementary Therapies. Michelle Thersby herself will continue to offer her Holistic Physiotherapy sessions at the cottage. Bailey Essences and Bach Flower Essences, and also making flower essences of Ilkley Moor, named after our Roman-Celtic Goddess of Wharfedale, Verbeia. The one Roman altar stone that includes the name of the goddess, Verbeia, is now housed in the Manor House, so it is totally appropriate for Ilkley that the Verbeia flower essences, and their related body care products, should now be made so close by. Ilkley Complementary Therapies will be operating from Cottage, 2, Castle Hill, opposite the front of the Manor House from Monday 4 February.